Update: Unlocator is working with Buffalo to restore connectivity as the Buffalo routers have run into temp problems with the network. Use the ASUS RT-N16 instead as it connects to VPN just fine. Looking for the ultimate VPN router then look no further. With and impressive 128mb RAM to run the DD-WRT firmware, this is a monster router set to give you the best VPN throughput on the market. 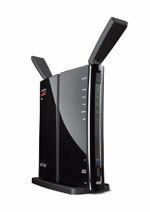 This router is currently the king of the Buffalo Airstation routers and deservingly so. As mentioned above the WZR-HP-AG300H comes with 128 mb of ram, and allows the firmware to process VPN tunneling (What is VPN) super efficient and hereby making sure that you are not loosing speed on your connection due to a bottleneck in the router. On top of that the router works as a dual band network with speeds up to 300Mbps and Creates 802.11n (2.4GHz / 5GHz), 802.11a, 802.11g and 802.11b networks. Here at VPNfreedom we are of course focused on the VPN capabilities of the router. The reason being that this router is an obvious choice if you are looking to unblock from outside the US, or simply want access to the American version of that has a much larger selection than any other country. Devices such as the Apple TV, Roku Box, Xbox 360, Playstation 3, Wii, Nintendo 3D, HD TVs, Blu-Ray players and other set-top boxes do not have a build in VPN client. By using a router like the WZR-HP-AG300H that is connected to Unlocator (Yes that is their name) then you can access on these devices from outside the US. 5/5 Stars.With the easy AOSS one push button setup, powerful CPU and plenty of Ram, FTP server feature, USB Storage Port, Dual Network options and build in VPN client then this is a winner. On top of that the price point is realty aggressive. A must have in my book no matter if you are looking for a VPN router or just a regular router for every day use.